As I enjoyed my first balmy winter in Vancouver two years ago, I noticed that long-term Vancouverites loved to kvetch about the rain. “Not a very nice day out there, is it?” they would mutter as they came in and shook off their umbrellas. I understood that talking about the weather is a way of starting a conversation — of breaking the ice, so to speak. Would that all it took to break genuine ice was to talk about it! The slippery roads and sidewalks in Vancouver this winter have been front page news here for about a month. A recent article, illustrated by a line of pail-toting people hoping to access free salt at the firehalls before it ran out, included “salt lack city” in the headline. Good one. If folks had shovelled the slush from the sidewalks and the city had plowed the snow from the streets back in December, getting around early in January would have been relatively easy. But many home and business owners were caught without salt and shovels. Hardware stores sold out of both quickly. The city has few snowplows. Another issue is a laissez-faire attitude. Previous experience had taught everyone that a few warm days will soon melt the mess away. This winter, many cold days in succession turned it rock hard instead. I blanched the first time my little Fiat, Gumdrop, started spinning her wheels on ice, while the dash flashed a bright yellow “ESC, ESC, ESC,” message. That would be a pretty mess if I abandoned my stuck vehicle, I thought. I meant to check the owner’s manual on whether ESC means what I think it means. My son enlightened me by looking it up on his phone. In Fiat-ese, ESC stands for Electronic Stability Control. Aw, Gumdrop was telling me she was trying to help. Regardless, I decided to leave her parked for a while. Walking didn’t feel much safer. 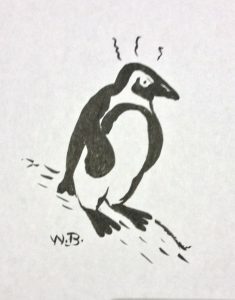 I attempted to master the penguin walk, where one leans slightly forward and takes small steps to improve balance on ice. It rained on Sunday, January 8. I rejoiced as I hoisted my umbrella, happily skipped over torrents of meltwater coursing towards sewers, and delighted that the mountains were shrouded in rain-bearing clouds. After our recent experience, this respite of “normal” winter weather is a gift. I haven’t heard a peep of complaint. This entry was posted in Writing on January 13, 2017 by Wilda.